Explanation: Since Saturn's axis is tilted as it orbits the Sun, Saturn has seasons, like those of planet Earth ... but Saturn's seasons last for over seven years. So what season is it on Saturn now? Orbiting the equator, the tilt of the rings of Saturn provides quite a graphic seasonal display. 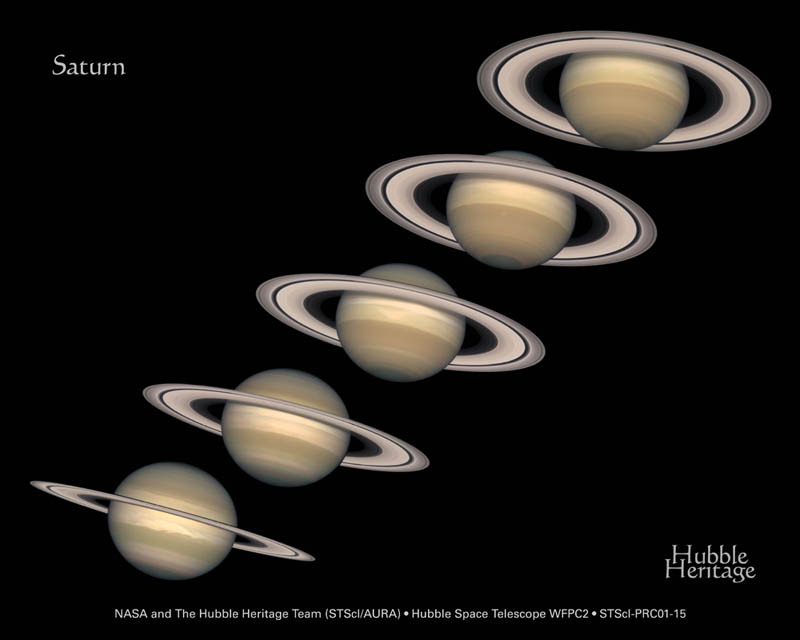 In fact, this month, Saturn's rings will reach their most "open" angle after appearing nearly edge on in the mid-1990s. The ringed planet is also well placed in evening skies providing a grand view as summer comes to Saturn's southern hemisphere and winter to the north. The Hubble Space Telescope took the above sequence of images about a year apart, starting on the left in 1996 and ending on the right in 2000. Although they look solid, Saturn's Rings are likely less than 50 meters thick and consist of individually orbiting bits of ice and rock ranging in size from grains of sand to barn-sized boulders.